At Foss, we recognize that our employees are the foundation of our company and of our success. We value and respect the men and women that make up the Foss family and are proud to have one of the industry’s highest records for employee longevity. Vertical and lateral growth opportunities exist inside Foss and within our sister Saltchuk transportation companies. We strive to promote from within whenever practical to fill open positions. As vacancies arise, we consider both internal and external applicants. In addition, we also offer a wide array of training programs and classes, advanced operational certifications, tuition reimbursement and unparalleled on-the-job experience to develop expertise. Entry level positions include Ordinary Seaman, Wiper and Cook. These positions require little to no formal education past high school, with some short-term on-the-job training. Unlicensed trades include Able Seaman/Seafarer , Tankerman, Assistant Tankerman, Qualified Member of the Engineering Department (QMED), and Oiler. 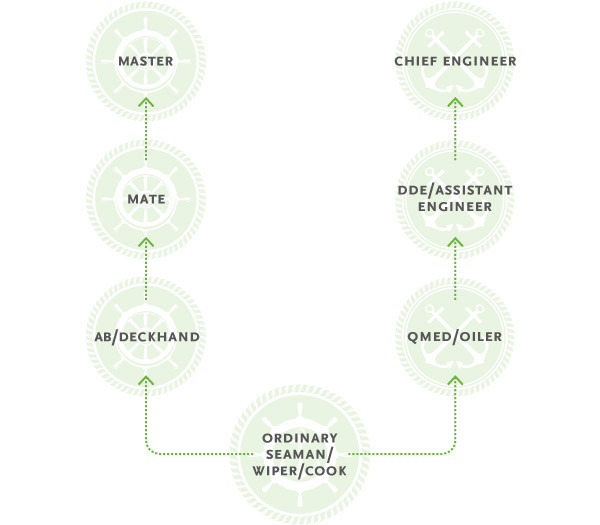 These positions can require vocational training, maritime courses, apprenticeships, and/or a combination of time on-the-job at sea. Licensed positions include Mate, Licensed Marine Engineer, Designated Duty Engineer (DDE), and Master. A High School or GED equivalent is required, as well as licenses and certifications based on advanced coursework through maritime academies, colleges and/or the Coast Guard, plus long term on-the-job training and minimum time at sea requirements.